As 2016 is almost over and the winter weather sets in hard in Beara, I took the time to get out my calendar and see what I’m going to work on over the next few months. I have decided that I wish to tackle the Dressage Ireland Winter finals in Spring next year. This means two scores over 63% at the same level to qualify for the finals. I have in my sights the first event in early December to, hopefully, give me one qualifying score or at least a benchmark on what to improve on. I will have to transform my cob mare into a dressage diva! To make sure I am on the correct road for this, I will take part in the E-Dressage’s Winter Challenge. With E-Dressage, I can complete preliminary dressage tests from home and get the feedback I need to perform better at competitions. There will be many dark evenings riding around the arena to look forward to! I aim to get my little cob out for her first riding competition in early January. It is a charity show in aid of suicide prevention, and they will be holding showing and show jumping. I will be taking Edanna into the cob class and possible Danu into the small hunter class. Clipping the hairy mongrels will be a challenge in itself! As I have taken my horses in for the winter, here are a few tips to keeping on top of their nutrition. Haynets are your friend! They save so much waste when feeding into the stable or in the field. You can keep an eye on how much your horse is eating, and weigh them to ensure your horse is getting enough. They slow the horses down when it comes to feeding. My horses just love to hoover their hay and have nothing then for hours. I often put two haynets into each other to really make them work for it. Haynets might be a nuisance to open and start putting hay in, but they have their benefits! Wintertime, for lots of horses, mean little/no access to grass. Hay or haylege is their source of roughage and fibre and that is pretty much what they need to just stay warm for the cold months. Hay itself has a low vitamin and mineral content, which our beloved horses need to get elsewhere. 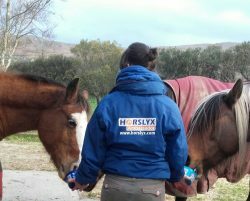 I use my respiratory horslyx to ensure my horses are getting the vitamins and minerals they need during the winter. They have full access to it all the time and take it when they need it. I like the respiratory lick as, even the best quality of hay, will have both breathable and respirable dust. This way my horses’ airways are kept clear. Happy ponies!